Grasshoppers are often worse in hot, dry conditions. One big reason is because insects, as cold-blooded creatures, eat more and grow faster in hot weather. The other reason is that hot, dry weather limits fungal infection, one of the main threats to grasshoppers. In dry weather, a larger proportion of eggs hatch. 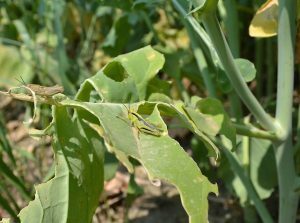 The nominal threshold for grasshoppers in canola is eight to 12 per square metre. The higher end of that range may be more appropriate in a typical canola crop as, given a choice, most grasshopper species prefer grass and cereals to canola. Grasshoppers are often at higher numbers at field margins, making a targeted spray possible. But they will migrate across fields, so scout to see where that “margin” ends. The challenge with the nominal threshold is counting the grasshoppers. As soon as you walk into an area, grasshoppers take off and do not cooperate with your attempts to count them. So entomologists have come up with more practical scouting techniques. 1. Walk across the field. If grasshoppers jump around with every step you take, and seem to be general throughout the field, numbers are probably at the threshold. 2. Look for feeding. If there is less crop than there was the last time you checked, and the problem appears to be grasshopper feeding, spraying may be warranted. 1. Measure off a distance of 50m on the level road surface and mark both starting and finishing points using markers or specific posts on the field margin. 2. Starting at one end, either in the field or the roadside, walk toward the other end of the 50m making some disturbance with your feet to encourage any grasshoppers to jump. 4. At the end point the total number of grasshoppers is divided by 50 to give an average per square metre. Avoid spraying on hot, hot days. At temperatures above 25°C, grasshoppers can metabolize insecticide more quickly, and it can be less effective. Warm, not hot, days result in slower metabolization and better control.